Today is the first day of the rest of my life. I know that sounds cliché and probably a bit dramatic, but it’s true. Today I begin doctoral studies at Emory University. It’s almost unreal to me that this day is here. I’ve prayed about this, put in the work, had a small community of family, friends, and colleagues helping me through the process and this moment has finally arrived. Yesterday evening as I was with some of my cohort at a picnic, one of the faculty members said, “Enjoy your last night of freedom.” I hated the sound of that but I recognize that in many ways I’m losing the freedom I’ve known for the last few years. I’ve taken a drastic cut in compensation to pursue this degree. I’ve moved out of my nice one-bedroom apartment to share a house with some good friends–which I must say is actually nicer than the apartment I left. I won’t be able to go out as freely, eat as lavishly, and spend as much money on any one thing as I’m accustomed to because of this journey that I’m embarking on. Yet for all of these sacrifices I’m still thinking a lot about promises I want to keep to myself for myself, my family, my friends and this city that I will call home for the next 5-6 years. 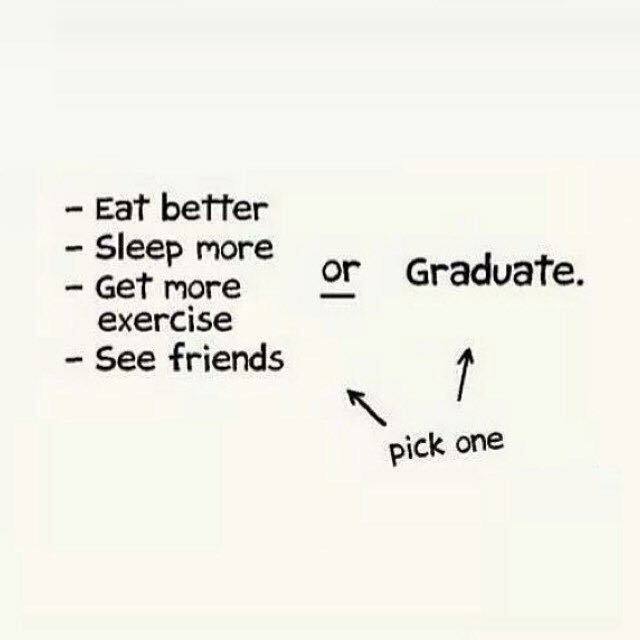 I don’t want to be one of those people who makes graduation the target at the expense of livelihood, health, friends, and family–because there are apparently people who will sacrifice all of that in pursuit of this degree (see below). I recently saw this posted on a groups for PhDs and I was shocked to find that most picked graduate over everything else. Put God First: When I first wrote this list I actually had something else first, but when I wrote it again I decided to put God first, even if only for semantic reasons. But really, I don’t just want God to be first on a technicality, I want God to be first on purpose. I believe that I didn’t get here on my own and I don’t think I will get through this without grounding myself in God. My goal is to recover my relationship with God and get God back to the number one spot by getting back to the spiritual disciplines and committing to worship every week. Do Your Best, Not Anyone Else’s: What great temptation there is to meet everyone else’s expectations or compare yourself to others. To meet the expectations of faculty, of the people who recommended you, of friends who believe you’ll do everything exceedingly well, of family who are rooting for you…But this is not for any of them, not totally. No, my job is to do my best and not anyone else’s. To not drown myself in everyone’s expectations nor to get pulled into the sin of comparison. My goal is to do my best every single time. I will read as much as I can every single time, ask the questions that are important to me, risk sounding stupid if I just don’t understand something, write with courage and present with confidence. And if I ever fail to do any of those things, I won’t beat myself up, I’ll just do my best the next time. Take Good Care of Yourself: I know myself. In my first graduate program I was notorious for keeping late hours. I drank a lot of caffeine–albeit healthy caffeine (Shot outs to Guayaki Yerba Mate!). I sometimes ate garbage foods. I didn’t make much time for exercise. I had a one-track mind. But this time around I don’t want to do that nor do I think I can afford to do that. My goal is to keep the same exercise routine I had before the program started which means I will exercise 2-3 times a week. I have to do this because I can’t afford to gain any weight–literally, because I don’t wear cheap clothes–but also because–and more importantly–I believe that a healthy, fit body leads to a healthy, fit mind. Eat Well: If you know me you know that I love to eat. My ex-boyfriend once said that I eat like it will be my last meal. This doesn’t mean I eat like the food is running off the plate but that my meals are sometimes too lavish and opulent. I’m like the Marie Antoinette of food. I have no problem spending a lot on a meal with friends–granted I won’t be able to do that often given my new graduate student status–because I love a great food experience and great company. But, in keeping with my new status, my goal is to still find ways to eat well by simplifying ingredients, buying fresh food, and treating myself dining experiences on occasion–maybe once a month. I want to get to a place where dining out becomes special, an incentive even, rather than just this part of life that I feel I’m obligated to because I can afford it. So eating to live will be my first priority and every now and then I’ll live to eat. Keep In Touch with Family & Friends: I sometimes drop off the face of the telecommunications earth and the only way I can be found is on social media. When I have a lot on my plate the last thing I want to do is pick up the phone. Maybe I’ll text you, maybe I won’t. Maybe you’ll call me and I won’t pick up or call back for days/weeks on in. I first hope that no one takes this personally and charges it to my head not my heart. But I also hope to just be better about keeping in touch with the people I love–and even those I just like, moderately. My goal is to communicate with family and friends regularly. I honestly can’t say what the frequency of this will be because I know it will vary, but If you don’t hear from me for more than two weeks, and we communicate regularly, reach out. Make Time for Love: When I first found out I got in to this program I joked that I was going to start a new blog entitled, “PhD or Mrs: Which Will Happen First?” Right now I’m almost willing to place my bets on finishing my dissertation first before I get married. The former seems so much easier to me. I’m also just happy being single and recognize that I can get a lot accomplished as such, but I don’t want to be single for much longer. There are so many amazing things happening in my life that I want to share with not just family and friends but also a partner who can sojourn with me and I with them. I want nothing less than someone who knows their purpose and is actively working to manifest it because that is what I’m doing. I want someone who’ll sit in a coffee shop and read with me when I’m reading–their own book of course, cook dinner when I’m on the verge of starving myself, whisk me away when I get too wrapped up in all of this, and generally be a confidant and co-conspirator in living on purpose. I say all of this not to sound completely self-interested in what someone can do for me in a relationship, but to be clear that I need a partner who will support me. I’ve never had a problem being a man’s cheerleader, support system, confidant, chef, Kleenex, but it’s time for Nicole to also receive the same. But none of this will happen if I’m always in the library, my room, or the corner of a coffee shop–well actually I guess he can find me in the library or coffee shop. My goal is to be intentional about making time to date truly interesting people and be open to the package the truly interesting people come in. I wouldn’t mind a neuroscientist or chemist, just putting that out there. Be Yourself and Grant That Self Grace: Truth is, I may fail to keep all of these promises. I may wake up with just enough time in the morning to shower and get out the door. I may compare myself to my colleagues. I might stop exercising for a stretch out of necessity or straight-up exhaustion. I may go back to eating BBQ rice because that might be all I can afford. I might go into an isolation so deep that only my housemates can pull me out–and that will only be because we live under the same roof. I may remain single for the next six years because, hell, it might really be easier to complete a dissertation rather than navigate these dating streets. A lot can happen, but in the midst of it all I want to remember two things, 1. I want to remember to be myself and be gracious to myself. Just this past Sunday I had a friend jokingly greet me saying, “Hey doctoral student!” I replied, “Nicole is sufficient.” I’m not interested in being called “Doctor” or “Professor,” especially not before I’ve rightfully earned those titles. I want to be Nicole through all of this, the woman with a good sense of humor, a healthy appetite, a high-sartorial sense, a lover of God, cupcakes, and dresses. A good daughter, loyal friend, distant but lovingly consistent family member, a civically-engaged citizen, and a grounded child of God. I know I will change through the years, but don’t let me change too much. So if you read this and we are friends, either in real life or just virtually, will you hold me accountable? Periodically ask me how I am doing–please don’t assume that because I look or sound like I have it together that I actually do. Ask me when last I prayed and encourage me to do so–maybe even pray with me if you are feeling inclined. Ask me about the last good meal I had; if I’ve exercised lately; if I’ve met any handsome, brilliant, wonderful men; ask me if I feel like myself. Ask me anything. I know that I am because of many of you who have nurtured me up to this point. I will continue to be because of that as well.